Posted by Arun Rajagopal in Movies. I woke up pretty grouchy and pooped out this morning. And I knew that watching Mr. Bean’s Holiday would probably perk things up a little. Guess I underestimated Mr. Bean’s powers. Mr. Bean’s Holiday is a laugh riot from the moment he wins a holiday to the French Riviera in a church raffle draw. What ensues is a trail of comedy, commotion, madness, slapstick wit, chuckles and merry mirth as the irrepressible Mr. Bean makes his presence felt in the République française. I was wondering what was my best moment in the movie – I think it has to be one where Willem Dafoe sets off the explosion on his commercial video set, or it could even be the one where Mr. Bean is grooving to Shaggy’s Boombastic. And now that I think about it – I can think of a dozen more. Make sure you join Mr. Bean on his trip of a lifetime. You wanna’ know what this is all about? You can say this about drugs or guns or bad decisions, what ever you like. But this whole thing is about parenting. And taking care of your children. I loved the feel of Alpha Dog – urban-youth degradation, parents who don’t know where their kids are headed to & don’t seem to be in a position to help cuz they are in pits of their own, spoilt-white brats having their own take on black gangsta-ho culture – also felt some performances were good, especially Justin Timberlake, Anton Yelchin and Emile Hirsch. The movie was censored in Muscat, and I’m longing to get my hands on the uncut DVD. The choice of soundtracks for Alpha Dog is pretty good too – I’m now hooked to DMX’s Lord Give Me A Sign, and Tech N9ne is definitely an act to watch out for. Tracks by the likes of Lowd, Eva Cassidy, Aaron Zigman, Paul A. Graham and Paul Bushnell complete the ensemble. Firstly, the movie didn’t look good on the big screen. Wonder about the quality of the film roll used – it seemed to be made with a simple, humble camcorder. TA is a love story with street smart hero Dhanush pitted against the well-oiled business tycoon Prakashraj, the brother of his lady-love. 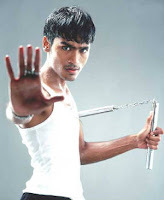 TA suffers because of a pretty weak story – though Dhanush emotes effortlessly in patches… TA is flawed from scene 1. Booboo.